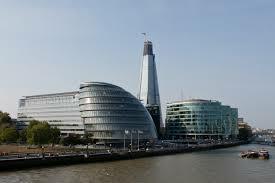 Being a caterer in Southwark is great, and living here too has its benefits. Southwark is one of the oldest areas in the London; it was an ancient borough in the past that was comprised of several parishes. Back in the 19th and 20th century there was a significant depopulation in Southwark but that’s all changing now, regeneration has been paying off and there’s more and more that Southwark can boast every day. The Cuming Museum is a great day out and you’ll find the full story of Southwark there. Other attractions in Southwark are the Nunhead Cemetery which is an old Victorian burial ground, and for a shopping day out you can’t beat Elephant and Castle Shopping centre, there’s a selection of high street shops and a mix of ethnic shops. One of our favourites is going to the Surrey Docks City Farm; it’s an enthralling trip whether you’re going by yourself as an adult or as part of a day out for the kids. There are pigs, goats, bees and all sorts and the team there are great people. For food there’s a good collection of restaurants, cafes, pubs, fishmongers and butchers. You can find really high quality produce at the local markets, and many of the restaurants around the area buy from them. With all that on our doorstep it helps to explain how we manage to make hog roast Southwark catering as good as we do, we’re helped a lot by being able to simply jump in one of our vans and drive not very far at all to a farm, butchers or fishmongers to get unbelievably fresh produce. A local event with a local caterer that uses local produce, can you script a better mix of ingredients for a roaringly successful occasion? 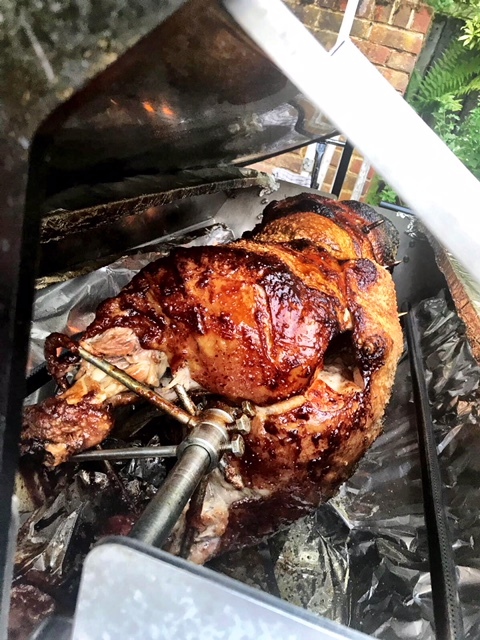 Magnificent roasted pigs are our favourite thing in the world and we’re probably the luckiest caterer in Southwark because it seems that what we love is your favourite too. Going off the number of queries and bookings that we receive in the Spitting Pig office, it’s obvious to us that people love spit and tray roasts. And it’s not just one type of client that books us; it’s not as if we only receive bookings for a wedding, or for party events. No, our catering is booked by all people and for all occasions. For any event you can make a booking from a really large and varied choice of menus. You can pick for your event a menu that really complements and brings out the best of it. 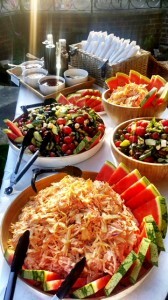 Garden parties are excellent events to cater at due to the rustic feeling of roasting your meat in the outdoors. If the sun is blazing and the delicious aromas of the hog roast are filling the air then you are guaranteed to are going to enjoy an incredible catering experience from hog roast Southwark. We recently roasted a hog for a very wealthy customer who had invited his family and close friends to see him and his wife tie the knot at a very intimate and beautiful ceremony. We prepared the meal under a gazebo and laid a serving table with the freshly prepared salads and some new potatoes in herb butter; the perfect accompaniments for a wedding meal I’d say. We served drinks to the tables at regular intervals during the day and made sure everybody’s glass were full for the best man speech which was hilarious yet touching at the same time; after everybody had raised their glasses to the newlyweds, that is when the real celebrations started. This was our cue to clear up and leave them to celebrate well into the night. We a happy to have been part of a magical day. Whether your requirements are a simple menu just to keep heads fed at a business breakfast, or whether you’re really going all out and want to give the grandness of your wedding an event the proper catering mark of an approval with a hog roast with a number of great dishes to go with it. For weddings we even offer a 2-part menu plan, a wedding reception dinner and then the second hog roast helping comes in the form of a hog roast Southwark buffet later in the day. Hog roast catering can be provided for very large events, events even that have thousands of guests. By rule, one very large pig can feed a good few hundred people, and you only need one hog roast chef to a hog roast machine. That’s one of the deciding factors in why more of our clients are starting to come back for the hog roast hire Southwark option, because they’ve seen what we can do with a pig, chef and machine, and they know that with a machine and a pig they’ve got the power to do the same thing and cater for their own friends. Hog roasting makes a refreshing change. If you love trying new things and have a sense of adventure then hog roast hire Southwark is an option that you won’t be able to turn down. Like the spit roast food itself, hiring a machine proves an irresistible option for most. Throw in the fact that we can sell you a pig from our own stock with the machine, deliver the machine to you for free at a delivery date of your choosing – and return it – and we’ll give you a brand new bottle of gas needed to run the spit roast machine and you can see how it’s convenient and popular amongst our clients.